After a pub dinner of fish and chips and fried calamari and beer followed by several hours of indigestion during an overnight stay in amotel, we drove over to Katonah, NY, for a performance of Donizetti's La favorite at the Caramoor Festival. 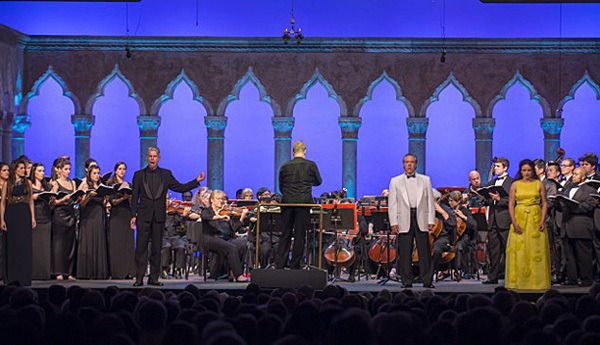 Bel Canto at Caramoor is a tradition that has been going on since 1997 at the site of the Venetian-styled estate and gardens near the Hudson, not far north of New York City. Will Crutchfield, once music critic for the New Yorker, has been the driving force behind Bel Canto at Caramoor from the beginning, and in the last few years he has been exploring Italian composers who wrote massive works in French for the Paris Opèra. Caramoor has seen Rossini's Guillaume Tell (2011) and Verdi's Don Carlos and Les Vêpres siciliennes (2013), and this time it was the turn of Donizetti, with his French grand opera, La favorite (The Favorite). Caramoor can be a delight or a trial, depending on the weather. I have been there when the heat and humidity are so oppressive that sweat runs down your face and thousands of noisy, swishing hand-held fans distract from the music. 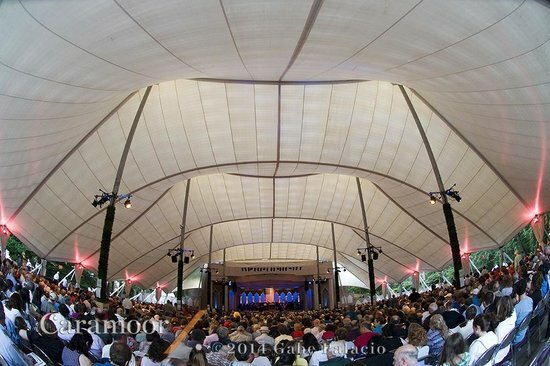 The performances at Caramoor are under a huge white tent, and I have also been there when the heavy, steady rain so drowned out the music that it was hard to hear. Nowadays, amplification can be turned on in case of rain. This year the weather cooperated. It was not too hot, and there was no rain, and a gentle breeze cooled the capacity crowd of Donizetti lovers under the big tent. In the afternoon there were informative lectures and concerts of music related to the opera at hand, performed by the Young Artists and Apprentice Artists studying at the Festival under Maestro Crutchfield. After all of these musical hors d'oeuvres--and a break for a picnic dinner on the lovely grounds of the estate--there was a lecture on the opera (not particularly good on this occasion) and the main course arrived, a concert performance based on the critical edition. The free afternoon hors d'oeuvres included an interesting lecture by Crutchfield on le chant héroïque, the kind of singing that French singers regularly used in the day of La favorite, amply illustrated by early twentieth century recordings. Next there were two vocal concerts. The first featured rare duets performed by the Apprentice Artists, mostly salon music by bel canto composers. The second concert featuring the Young Artists, comprised a series of mostly extremely rare pieces from the Bel Canto period in France. Beside more familiar excerpts from Benvenuto Cellini and Il viaggio a Reims there was the baritone aria "Par toi, Sara, ma vie" that Donizetti wrote for a production of Robert Devereux in French for Lyons (? ), a stunningly beautiful mezzo-soprano aria "Adieu, donc, belle France" from Louis Niedermeyer's Marie Stuart, and a rousing tenor-baritone duet from Fromental Halévy's La reine du Chypre. Rarest of all was an aria from a never performed opera by Gilbert Duprez, the tenor who brought us the high C sung from the chest. The opera was called Tariotti en Bulgarie, but for some unexplained reason the aria for soprano was sung in Italian as "Qui tranquilla almen poss'io." The aria is certainly a testament to the fact that many singers in the nineteenth century were also composers and actively assisted and advised the composers of the operas they helped to birth. Isabel Gaudi, the attractive soprano who sang this aria, also played the role of Inès in La favorite. We did get the full La favorite, in French, complete with all the ballet music. Of interest to Donizetti lovers was the inclusion of a cabaletta to the Léonor-Alphonse duet "Dans ce palais" which the Opéra cut after the first performance in 1840. This extended section develops the relationship between the King and his mistress, and the music is good. It is included as an appendix in the critical edition, but apparently this was its first performance since the opera's premiere. It was wonderful, by the way, to hear the complete ballet music. Surely, it must be one of the very best operatic ballets. 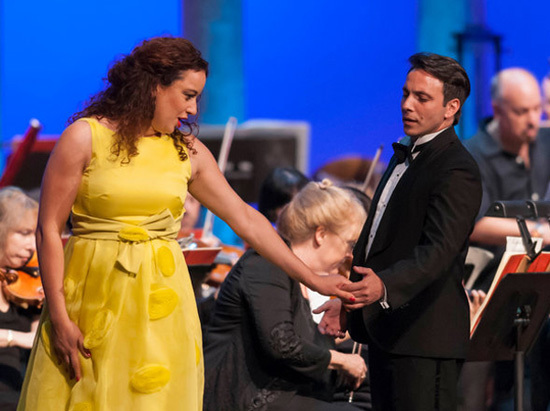 The principal roles of Léonor and and Fernand were taken by young singers previously unknown to me--the French mezzo-soprano Clémentine Margaine and a light lyric tenor from Argentina, Santiago Ballerini (above photo). Ms. Margaine possesses a deep chest voice of great power, reminiscent of Giulietta Simionato in this role. She was not always perfectly on pitch, but she was impressive in her big moments, especially "Venez tous, c'est un fête," the intense cabaletta to her aria "O mon Fernand." Ballerini shows an accomplished technique, although with Pavarotti echoing somewhere in my ear, I am used to a heftier voice in this role. Perhaps best of all the singers were the low voices--baritone Stephen Powell as the sonorous King, Alphonse XI, and bass-baritone Daniel Mobbs as Balthazar, the judgmental Father Superior of the Monastery of Santiago de Compostella. The Orchestra of St. Luke's conducted by Maestro Crutchfield sounded a little muddy to me in the fine overture, but they settled down and proved to be solid and attuned to the style, especially in the ballet music, which requires complicated obbligato passages in three of the dances. It has always seemed to me that Fernand is a particularly naive (to put it politely) hero: he falls in love with an unknown woman while offering her holy water in church and gives up his plan to take monastic vows; then he becomes a warrior and wins crucial battles for King Alphonse, getting Léonor as a reward, all the while not realizing that she is the King's mistress. When he finds out, he immediately rejects her, shaming her, Alfredo-like, before the assembled court. Léonor and Alphonse have more complexity and depth, and their music shows it, or so it seems to me. The opera itself is based on a series of grand tableaux in the manner of much French Grand Opera, and as such, it has always seemed pretty static to me. So I found it only a small loss that this performance was a concert, although an acted one: none of the principles had music scores or stood still to sing. The great glory of La favorite lies in the beauty and sophistication of its melodies--Donizetti at his very best as a composer of memorable melodies. Not mere tunes, these unforgettable melodies define the characters and make them live. And the Caramoor performance confirmed that fact time and again. The nearly sold-out audience confirmed it too, applauding with rapt enthusiasm. Of interest to Colorado opera fans: among the talented Apprentice Artists was Teresa Castillo, a soprano who has sung frequently in the Denver/Ft. Collins area, most recently alternating the role of Yum Yum in Loveland Opera Theater's Mikado last winter. Ms. Castillo acquitted herself very nicely in a duet by Cherubini with Suzanne Karpov, another soprano. She also was a member of the chorus for La favorite.